It doesn’t pay to try to analyze this horse. He has run his halfs in :45 4/5, :47 1/5, :49 2/5, :49, and :47 1/5. He comes home fast in some races and not so fast in others. He wins with his ears pinned whether he’s doing it easily or not. In short, he just gets to the wire first and it doesn’t seem to matter how he does it. That is evidenced by his last three Beyer figures of 95, 95, and 95. Some may ask: is what we’ve seen all he’s got? Is that as fast as he can run? He had four sharp breezes in a month leading up to the Holy Bull, bounced out of that race with a bullet :47 3/5 half-mile breeze and then had an easy half in :49 3/5, so McLaughlin didn’t really do a lot with him in the four weeks between races. He has managed to get two victorious preps in him without getting anywhere near the bottom of him; at least that’s the way it appears. You want to save that big speed figure for the first Saturday in May and not use it now. He should be tested for the first time when he takes on a razor-sharp Nyquist in the Florida Derby, and let’s just hope each doesn’t make the other empty the tank. If that race goes as expected they’ll both need the five weeks to the Derby. Baffert is right back on schedule with him, working him 6 furlongs in 1:12 1/5 in company with Dream Team, which followed his sharp 5-furlong work last in :59 4/5 after the colt’s work had been aborted prior to that. This was one of the more impressive works I’ve seen this year, as he did everything on his own, other than being nudged just a little at the end. Not only does he run low to the ground with long, efficient strides, he cuts the corner so smoothly and appears to drop his head even lower when he switches leads. The San Felipe is expected draw a competitive field of talented horses that looks more like the Santa Anita Derby than a prep for it. Whoever wins this likely will be the leader of the Califorinia 3-year-old division. Right now it seems to set up well for Mor Spirit, with Danzing Candy, Uncle Lino, Smokey Image, and Exaggerator all expected to be on or close to the lead. Because of the classy speed and the overall talent in the field, there is the danger of a horse having to take too much out of himself to win it, and that is why this looks more like a Santa Anita Derby field. What do you do for an encore if this turns out to be a battle? One thing that looks certain, if everyone runs their race, there should be a few shattered Derby dreams when it’s over. He seems to have an advantage because of his experience and he also never seems to be taking too much out of himself. Finally, it’s time to find out what kind of transition he’s made from 2 to 3. He’s going to be meeting several talented horses, some of whom have excelled over the Tampa track, and I like that he went there early and had a sharp half-mile breeze in :48 2/5. He certainly doesn’t need to win, just show that same closing punch we saw last year. The reason he’s been ranked so high all year is that consistent late closing punch and the way he blew by a classy horse in Exaggerator, who was making a winning move in the Breeders’ Futurity. And as I’ve seen saying, unlike the Breeders’ Futurity, he simply ran out of room in the Breeders’ Cup Juvenile with the shortened stretch at Keeneland and having to negotiate his way through traffic. Do I know how good this horse really is? Of course not, and I admit he probably shouldn’t be ranked ahead of Nyquist, but so far he just seems to have exhibited all the traits you look for in a Derby horse, so between that and my silly Dale Romans/Derby gods connection, I just decided to stick with him until he proves me wrong. Or until it looks as if it is McLaughlin on whom the Derby gods are smiling down. I’ve waited this long with him I might as well wait one more week. O’Neill, fearing bad weather, moved his work up, and the colt went his half in :48 4/5. O’Neill was happy with the move, saying he was “full of energy,” adding that the undefeated champ will do all his training at Santa Anita before shipping to Gulfstream for the Florida Derby and his much-anticipated showdown with undefeated Mohaymen. Knowing how O’Neill trained I’ll Have Another, you can bet he will give Nyquist plenty of fast open gallops to compensate for the colt going into his 1 1/8-mile battle off only one seven-furlong prep. In I’ll Have Another, O’Neill had a horse he and many others felt was an absolute lock to win the Belmont Stakes and become racing’s 12th Triple Crown winner, but the colt, after having another long fast “gallop” two days before the race, came back injured and not only missed the Belmont, but never raced again. It seemed like a case of one too many fast gallops. With Nyquist, O’Neil has decided to do most of his prepping in the morning and very little in the afternoon leading up to the Derby in the hope of getting him through the Triple Crown unscathed. He is foregoing the conventional and writing his own book on Derby training, and only time will prove whether he is right or wrong. For those who question his pedigree, forget about Uncle Mo, who is white-hot and we have no idea how far his offspring want to go. But Nyquist’s broodmare sire is out of a Pleasant Colony mare, his second dam is by Seeking the Gold, and his bottom line traces to (two-mile) Jockey Club Gold Cup winners and Hall of Famers Buckpasser and Arts and Letters. Pleasant Colony’s sire His Majesty and Arts and Letters are both sons of the legendary stamina influence Ribot. He breezed 5 furlongs in a sharp 1:00 2/5 for the San Felipe. Desormeaux got him coming home his last quarter in :22 4/5, adding, “He was under control, limber, and wasn’t stressed out afterwards, all things you want to see in a horse getting ready for a race, so we’re happy.” The key word with him is sharp. You know he’s going to be sharp coming off the 7-furlong San Vicente, but stretching out to two turns he just has to be sensible and be able to settle behind the pace. We know he can move anywhere on the track, but it is essential that he times his move right. Where that move should be we have no idea yet because he has yet to develop a true running style. He’s made his move in the final sixteenth; he’s made his move in the final furlong; he’s made his move two furlongs out; and he’s made his move down the backstretch. This race should tell us where he is most comfortable running and where he’s most comfortable making his move. If he can put the speed away, it will be interesting to see how much he has left and how he responds when Mor Spirit and even Cupid come rolling along to pick up the pieces. As I’ve been saying, I’ve liked this colt since he broke his maiden at Saratoga and believe he has more ability than most people think. But I must admit I have no idea what’s going on with him. He had another slow 5-furlong breeze in 1:02 4/5 and seems to be on a semi-vacation since the Holy Bull. I just hope wherever he shows up next he’s not too fresh, as he was in the Holy Bull, and if he runs in the Louisiana Derby, he’s not too fresh for the Kentucky Derby, with six weeks between races and one race in 14 weeks. I still don’t know how far he wants to go, considering he’s a half-brother to Justin Phillip and Keyed Entry, who wanted no part of distance races. His full-brother Algorithms looked to be a major player on the Derby trail, but was injured before we found out how good he was and far he wanted to go. So, despite my high regard for the horse, there are just so many questions regarding his pedigree and especially the odd schedule he is on. All we can do for now is wait for his next start, wherever and whenever that might be, and see what shows up. He turned in a sharp 5-furlong drill in 1:00 3/5 with regular rider Luis Quinonez aboard in preparation for the Rebel Stakes. He then galloped out 6 furlongs in a strong 1:13, pulling up 7 panels in 1:29. Remember, despite his come-from-the-clouds score in the Southwest, this horse is far from a plodder. He’s shown in his other races he can beat you from anywhere, from the outside or splitting horses down on the inside. His main weapon is an explosive turn of foot, which can be delivered at any point in the race, and, along with a super distance pedigree, that makes him extremely dangerous. He just needs to be coming on fast at the end of the Rebel and Arkansas Derby. He showed he knows how to win. Now it’s more about maintaining what he has and moving forward toward the Kentucky Derby. He’s going to have to face another large field in the Rebel, and you really don’t want him quite as far back as he was in the Southwest. What I love most about the combination of Mineshaft and Afleet Alex is that they are both making a resurgence of sorts, as so many stallions do, either as sires or broodmare sires. The more I think about it, the more I have to wonder if running him in the Florida Derby against Mohaymen and Nyquist is the best way to get him to the Kentucky Derby. But with a $1 million bonus attached to the Florida Derby, I doubt very much they will deviate from their original plan. It was just a thought. Right now he has shown he’s not quite mentally ready for the Derby mayhem, unless he somehow can get his act together between now and April 2. He is still way behind those two in every way – mentally, experience, battle tested, and overall foundation. Would he be better off having a little extra time and pointing for the Blue Grass Stakes instead, where he won’t have to hook up with arguably the two best 3-year-olds in the country who have never tasted defeat? It’s very possible. He is a magnificent-looking horse with a world of talent, but realistically, he’s run only three times, two of them in sprints. On the opposite end of the spectrum, Pletcher has already won a pair of Florida Derbys with lightly raced horses – Materiality and Constitution -- making only their third career start, and he really has no one to use as a substitute. With Materiality and Constitution, however, that was the highlight of their careers, although the latter did win the Donn the following year. Bottom line is I’m sure they’re not going to pass up a $1 million race and $1 million bonus with a horse who has only raced at Gulfstream Park and obviously loves the track. He turned in a sharp half-mile breeze in :47 1/5, second fastest of 78 works at the distance. He has been extremely consistent in his works all year, but showed more speed than usual this time. It must be the Uncle Mo and Rubiano coming out. For his running style he’s also been remarkably consistent in his races and would have an even better record had his big run not been stopped in the Kentucky Jockey Club (by his own doing) and Risen Star Stakes. As I’ve been saying, he needs to stay off the rail and make that big sweeping Fair Grounds move, even at the risk of losing ground. Remember, this is a horse who broke his maiden at 6 furlongs in his career debut, overcoming a severe bumping incident at the break and was no more than 5 lengths off the lead in his victory in the one-mile Street Sense Stakes at Churchill Downs. He worked a half in :48 3/5 in company, with Victor Espinoza in the irons. Gaines called the work “unbelievable.” He looked smooth and powerful coming down the stretch under no urging whatsoever. We know he’s fast and talented, and now he has to answer the all-important question of class. Following fellow Cal-bred California Chrome, a lot is expected of him in the San Felipe, and he will have his work out for him, having to deal with several quality speed and tactical speed horses. He showed he can wire his field while rating on the lead and he’s shown he can come from off the pace and overcome a ton of trouble, as he did two races back. Although his connections obviously want to win, all he really has to show is that he can compete at a high level with horses of this caliber and leave room for improvement. He is the unknown factor in the race and makes it all the more intriguing. Breezed 5 furlongs in 1:01 1/5. It’s still difficult to get a line on the Fair Grounds horses and how the six-week gap from the Louisiana Derby to the Kentucky Derby will affect horses taking this route. Although he’ll have only two Derby preps, he did build a decent 2-year-old foundation with all four of his career starts at a mile or longer. The fact that he came back from a three-month layoff and was able to win a graded stakes against 10 opponents, while holding the lead from the top of the stretch to the wire down the long Fair Grounds stretch is a good indicator as to how far he has come from 2 to 3 and how much improvement he still has. Along with Mo Tom, Forevamo, and Candy My Boy and possibly even Tom’s Ready if he returns to form, the local contingent should supply plenty of competition for whoever ships in for the Louisiana Derby. He breezed a half in :48 4/5 for Saturday’s Tampa Bay Derby, where he will take on much tougher opponents than he faced in the Sam F. Davis. But if his Davis performance is any indication of how good he really is, they’re going to have a tough time beating him, especially with a race over the track. As I stated last week when I put him in the Top 12, I just feel we’re dealing with a horse who is just coming into his own and you couldn’t help but notice how powerful he looked in the stretch of the Davis after Rafting made what looked to be a winning move on the turn. At first I thought Rafting just handed the race to him by failing to change leads and losing focus, but the way he came home, his last sixteenth in :06 1/5, I now feel he was just too strong and perhaps was the cause of Rafting’s problems by turning back his challenge and opening up on him, and thus discouraging him. He looks like a tough, rugged type who runs hard, much like his full-brother Creative Cause. The only reason SHAGAF is not in the Top 12 this week is because there was no reason to take anyone off, and with Destin running this weekend in the Tampa Bay Derby, I wasn’t about to drop him now. So Shagaf likely will have to wait a week for several of the top-ranked horses to sort themselves out. If Shagaf had done something extraordinary in the Gotham I would have had to make room for him, but his race had its good points and bad points, and, remember, this was only the third start of his life. The same can be said of Zulu, but the latter did hold his own against the top-ranked 3-year-old, having even less of a foundation than Shagaf. Now for the good points: He looked fantastic in the post parade and not only has the look of a Derby horse, but the refined features of a European distance horse, especially with his manicured tail, a la Chad Brown’s mentor Bobby Frankel. In short, he really catches the eye. For more info on him, see my Feb. 12 column. What I loved most about his race was the way he adapted to everything happening around him, as well as going two turns for the first time. And he did not have the smoothest of trips, yet rated kindly and took dirt in his face for the first time. He had someone looking him in the eye every step of the way. It was obvious Junior Alvarado on Rally Cry was intent of on keeping him boxed in and he was in traffic most of the way down on the rail and lost position when he tried to move up and Rally Cry moved with him and kept him pinned down behind horses. He finally was able to ease out when Rally Cry began backing up and wore down California invader LAOBAN, who was riding along the whole way on an extremely speed biased track. So he does get credit for running him down, and this was a great learning experience that should have toughened him up, and no doubt will move him forward. As for the negatives, the rail was golden all day and, despite the traffic, he was on the best part of the track until swinging three-wide at the head of the stretch. I can forgive slow times and even slow closing fractions under certain circumstances, but the closing fractions of :27 and :07 were agonizingly slow. He actually went his quarter in :26 3/5, but that is still extremely slow for this caliber of horses. In the Heavenly Prize Stakes for fillies and mares on the same card, they came home in :25 2/5 and :06 2/5, off a pace about a second slower than the Gotham. If you’re a Beyer pundit, you have to be concerned that he’s never run faster than an 88 Beyer figure, and actually ran a point slower in the Gotham than he did in his career debut. So, because of these factors and with the Gotham being run on the inner track, which has a terrible record producing Derby horses, I need to wait a little longer before determining just where he fits. I do expect a much more polished and brilliant performance in the Wood Memorial, where we’ll learn a lot more about him. That’s assuming the Wood is his next start, as Chad Brown also has Flexibility and My Man Sam in New York, and Economic Model in Florida heading to the Tampa Bay Derby. Coming off this kind of effort, as slow as it was, I can see him moving way forward off it, especially now that he’s shown he can go after horses in the stretch if need be. Based on his physical appearance and demeanor and overall look of class, I have no doubt this is a very serious contender. Like Zulu, I just wish he had one more race under his belt. Considering the inside speed biased track, you have to feel third-place finisher ADVENTIST also has tremendous room for improvement, as he ran hard down the stretch and tried to rally on the outside from near the back of the pack, finishing three-quarters of a length behind Laoban. And like the others he was unable to accelerate in the final furlong on what appeared to be a tiring racetrack. He is another with only three career starts, so it is difficult to get a true gauge on him and the other talented, but lightly raced horses. But like those others, we have yet to see the best of him, as each race has moved him a step forward. SUNNY RIDGE appeared to run his race, but was up against the rail speed bias, and was unable to give six pounds to these horses. Don’t be surprised if the Wood Memorial winner raced this weekend, but was not in the Gotham. Things change fast and horses get good fast this time of year and we had several new faces who bear watching.. First off, on Saturday, DONEGAL MOON, who has had an up and down career and is probably best remembered for stumbling at the start in the Jerome as badly as any horse in memory, finally found a good spot, traveling to Parx and demolishing an allowance field by 13 1/2 lengths. Yes, it was Parx, but from a visual standpoint he looked sensational, just blowing by the leader on the turn while still on cruise control and coasting to an easy victory and still coming home his last quarter in the one-mile race in :24 1/5, and :12 flat for the final eighth. He looked like a powerhouse in the stretch, with smooth strides and great extension. I am willing to forgive his fifth-place finish in the Withers, as it came four weeks after his debacle in the Jerome. It was a miracle he didn’t go down or do serious physical damage, either grabbing a quarter or knocking himself silly when his face actually hit the ground hard. We still have no idea how good he is or whether he can compete with the best, but just to have him on the Derby trail and winning races is pretty amazing. While watching Sunday’s 1 1/16-mile allowance race at Aqueduct that drew a pretty tough field, I kept thinking watching MY MAN SAM being pushed along vigorously nearing the five-eighths pole, some 10 lengths behind loose-on-the-lead MATT KING COAL, which certainly is not where you want to be on the inner track, that if he can sustain that long a run and is anywhere close at the finish he is going to be one to watch very closely in his next start. He kept coming and coming, and just when I thought he was going to run out of steam on this speed-favoring track, he kept up his relentless pursuit, passing one horse after another and coming within a length of catching Matt King Coal, who had opened a 4 1/2-length advantage at the eighth pole. Although I don’t like comparing times from different days, they did run a full second faster than the Gotham. Coming off an eight-length romp in a 1 1/16-mile maiden race, in which he was 15 lengths back, this effort confirmed that he is a serious horse, whose majority owner is Sheep Pond Partners of Lady Eli fame. What I also love about him is the third-place finisher in last race, CADEYRN, who he annihilated by 13 1/4 lengths, came off that race to break his maiden by 11 lengths next time out. I’d like to see him a bit closer and not give himself so much to do, and I’d like to see him duplicate this form on the main track or wherever he shows up next, but for now he definitely looks like an up-and-comer. By Tapit’s son Trappe Shot, out of an Arch mare and a tail-female family that traces to Forli, there should be no problem with stamina. This is one I’m definitely keeping a close eye on. As for Matt King Coal, take absolutely nothing away from his victory. He hadn’t run for over four months, since his sensational maiden score at Belmont, earning a 96 Beyer figure, and trainer Linda Rice felt he would be a little short for this race. He was sharp early, opening a clear lead over another highly regarded colt. MO POWER, who also ran a good race to finish third, having to chase Matt King Coal the whole way. It’s hard to tell how far Matt King Coal can carry his speed, but he no doubt is a gifted colt. All three of these horses are eligible to improve big-time off this race and, along with Donegal Moon, should make the Wood Memorial, or wherever they show up, all the more interesting when they get tested for class. Another allowance horse to watch from this past weekend is MADTAP, a son of Tapit, out of a Point Given mare, from the same connections as Gun Runner, who went to the front, re-took the lead after being headed briefly, and drew off to win the 1 1/16-mile race by 6 lengths in yet another impressive allowance victory this past weekend. As we head into March, people visiting Las Vegas or who have connections there may wish to take one last chance of landing a horse in the Kentucky Derby Future Book at a monster price. Unless you’re a big-time player who’s willing to spend a ton of money, you’re not going to get any bargains on horses who have accomplished anything of note. But that doesn’t mean there still aren’t a few out there at triple-digit odds who have shown enough to suggest they still may emerge on the scene as a Derby contender. Forgotten at 100-1 is FLEXIBILITY, who I had dropped from my first Derby Dozen when he ran in the Withers Stakes, which I felt was too much racing in a short-period of time (five starts in 3 1/2 months) for a young horse who had already been 1 1/8 miles and run hard on several occasions. But Chad Brown wisely decided to skip the Gotham and is giving him time to bounce back from his flat performance in the Withers. He needed a break after those two hard races against Mohaymen at 2, but Brown ran him twice in close proximity early in the year, obviously with the intent on giving him the time off now. He showed the effects of it in the Withers, but is fresh once again and back on a good schedule. He’s been working steadily, likely for the Wood Memorial, breezing a sharp half in :48 3/5 over the Belmont training track. But his status could depend on how Economic Model, also owned by Klaravich Stable and William H. Lawrence, runs in the Tampa Bay Derby. If he shows he belongs to be on the Derby trail, he likely will point for the Blue Grass Stakes and Flexibility likely would stay home for the Wood. If not, Flexibility could go for the Wood or the Blue Grass. Either way, for that price, to get a horse who has two big runner-up efforts against Mohaymen in graded stakes and is bred for stamina looks very appealing. He was a big deal back in early January, and I love forgotten horses. Also available at 100-1 is former Top 12 horse RAFTING. I’ve been waiting for him to return to the work tab and he finally did, breezing 6 furlongs in 1:15 at Palm Meadows. I can’t help but feel this is a very talented colt who just hasn’t gotten his act together mentally on a consistent basis. His move on the turn in the Sam Davis was powerful, but he blew it by failing to change leads and keeping his head straight. Plus, he probably needed that race, and with a race over that track he could surprise a lot of people in the Tampa Bay Derby, as tough an assignment as that appears to be. When he did put it all together and run professionally in the Smooth Air Stakes he handled Fellowship pretty easily, and Fellowship has come back to run third in the Holy Bull and Fountain of Youth. For 100-1 you not only get a talented horse who just needs to overcome his occasional greenness, but you get Graham Motion as well, and if anyone can figure this colt out it is Motion. Another interesting horse at 100-1 is CONQUEST WINDYCITY. The former needs to get faster, but was impressive visually winning a recent one-mile allowance race at Oaklawn. He turned in a bullet 5-furlong work in :59 4/5 Saturday, fastest of 45 works at the distance. By Tiznow, out of an A.P. Indy mare and trained by Mark Casse, he showed enough to suggest there is still a good deal of improvement. He’s finished first or second on fast and sloppy tracks and grass and turned in an explosive move on the turn to finish fourth in the Iroquois Stakes at Churchill Downs in only his second career start. He could break out, possibly in the Rebel, and looks to be worth a shot at 100-1. Rounding out the 100-1 shots is KASSEOPIA, another Motion-trained horse, who is strictly a guess, having never run on dirt and with an almost all European pedigree. But I liked his second-place finish in the Grey Stakes at Woodbine in his U.S. debut and I thought he ran a huge race to finish third in the El Camino Real Derby after a horrible start and making a big run from the back of the pack. He has the look of a classy horse and it might be worth 100-1 to take a chance he’ll handle the dirt and will learn to break alertly instead of just standing in the gate at the start, as he did at Golden Gate. He was originally intended for the Spiral Stakes, following a similar path as another Team Valor horse, Animal Kingdom, but may not get in the race, in which case he could be pointed for the Santa Anita Derby or Blue Grass Stakes. As I said, this one is a stab. I don’t know what woke up CREATOR in his last start, but he turned in as explosive a move on the far turn as I’ve seen all year and then blew his field away, winning off by 7 1/4 lengths, a far cry from his four second-place finishes in maiden races. A son of Tapit and owned by WinStar and trained by Steve Asmussen, how can you go wrong taking a shot at a whopping 250-1? He is still a work in progress and should improve with maturity, but when a horse wakes up that dramatically and shows that kind of turn of foot, he definitely is worth keeping a close eye on, especially with connections like this. The aforementioned MY MAN SAM wasn’t even listed by Wynn, so you could have gotten any price on him. I don’t know what his odds are now, but, considering he didn’t win Sunday’s allowance race, he still may be available at big odds. With what he showed on that track, he could very well be a bargain at whatever price you can get. So, to summarize, the triple-digit horses who could be worth a wager are Flexibility, Rafting, Conquest Windycity, Creator, and more of a guess, Kasseopia, with Cupid an extremely generous 85-1 if you can still get it. And check to see what odds they’re offering on My Man Sam. My Man Sam is only one of a number of talented 3-year-olds who would have only four career starts going into the Derby, and we know history is against those horses. 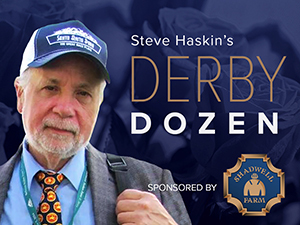 The others on the trail who would have to go into the Derby off no more than four starts are Zulu, Shagaf, Adventist, Mo Power, Malibu Sunset, Denman’s Call, Economic Model, and Dazzling Gem. That is a talented group who had better hope they have the physical and mental toughness and stamina to win the Derby off so few races. As I’ve mentioned, only two horses in the past 98 years have been able to accomplish it. A few others worth mentioning are FELLOWSHIP, who is still 100-1, despite back-to-back, come-from-behind third-place finishes behind Mohaymen in the Holy Bull and Fountain of Youth; the undefeated DAZZLING GEM, who defeated a solid field of allowance horses at Oaklawn, crushing Madtap, who came back to win by 6 lengths, and is quoted at 175-1. And at 250-1 is another Casse-trained horse, the stakes-placed SIDING SPRING, who just needs to settle into a steady running style and should in his second start with blinkers. He turned in a sharp 5-furlong work in 1:00 2/5 in company with the older grade I winner Noble Bird, who worked two-fifths slower. They’re all a gamble, but so is everyone to some extent, and these look to have some upside at a huge price. UNCLE LINO, who could be ready to burst on the scene in a big way in Saturday’s San Felipe Stakes, demonstrated his sharpness, working 5 furlongs in :59 3/5 behind a couple of workmates, second fastest of 51 works at the distance. Yet another son of Uncle Mo, his dam is a full-sister to Alabama winner Lady Joanne and a half-sister to Preakness and Met Mile winner Shackleford, multiple graded stakes winner Afleeting Lady, Indiana and Iowa Oaks winner Bagharia, and stakes-winning Stephanoatsee. He was forced to chase I Will Score in the Robert Lewis, and I would think he will have a more comfortable trip this time, giving us an idea of just how he wants to run. DANZING CANDY, whose best races have been on the lead, worked 5 furlongs for the San Felipe in 1:01 under Mike Smith. It looks as if CHERRY WINE’S minor setback hasn’t dulled him any, as he bounced back with a half-mile breeze in :47 1/5 at Gulfstream, second fastest of 78 works at the distance. Dale Romans’ main problem with him is trying to keep him on the ground for several more weeks after missing two starts already, not having raced since Jan. 9, and obviously being razor sharp right now. Romans might have thought he was sending his maiden winner LOOKIN FOR A KISS to Tampa for an easy score in a seven-furlong allowance race, but ran into a Tampa tiger in TIGER BLOOD, who was coming off a sensational 9 1/4-length maiden win in 1:09 4/5 at Tampa, earning a 91 Beyer in his career debut. The son of Cowtown Cat, out of a Smarty Jones mare, was just as impressive Sunday beating Lookin for a Kiss by 5 1/2 lengths under a hand ride. WHITMORE, who should improve big-time in the Rebel Stakes, remained sharp, breezing 5 furlongs in a bullet 1:00 flat in company with another talented Ron Moquett-trained 3-year-old, TISDALE, fastest of 22 works at the distance. Whitmore, who normally breezes in company, was on the inside under Greta Kuntzweiler and pulled away from Tisdale on the 6-furlong gallop-out, timed in 1:13 1/5. Whitmore will be ridden by Irad Ortiz Jr. in the Rebel. Tisdale, who broke his maiden in a three-horse photo last time, is headed for stakes company next, possibly the Spiral Stakes. Jack Van Berg is giving CUTACORNER another shot in the Rebel after the colt got cut up pretty bad in the Southwest Stakes. He showed he’s back in fine form by working a bullet 5 furlongs in :59 4/5 breezing at Oaklawn, fastest of 43 works at the distance. Also working for the Rebel was AMERICAN DUBAI, a game third in the Southwest Stakes, who breezed 5 furlongs in 1:00 3/5, out in 1:13 1/5 with jockey Chris Landeros aboard. DISCREETNESS, who took the worst of it in the Southwest, being forced eight-wide into the first turn from the 14-post, worked 5 furlongs between races at Oaklawn in :59 4/5 with jockey Jon Court in the saddle. Withers and Jerome runner-up VORTICITY, who worked 5 furlongs in 1:01 4/5 at his home base at Fair Hill, will be ridden in the Rebel by Kendrick Carmouche. Wayne Lukas will be represented in the Rebel by GRAY SKY, who breezed 5 furlongs in 1:01 3/5. The hard-knocking TOM’S READY, who finished a disappointing seventh in the Risen Star Stakes, breezed a solid half in :48 3/5 for the Louisiana Derby. Perhaps trainer Dallas Stewart is already trying to get the same kind of monster odds he got on Kentucky Derby runners-up Golden Soul (34-1) and Commanding Curve (37-1) and Preakness runner-up Tale of Verve. Risen Star runner-up FOREVAMO, breezed a half in :49 4/5. CANDY MY BOY, a gallant fourth in the Risen Star, breezed an easy half in :50 4/5 in an attempt to help him conserve his speed a little. A sneaky horse who could show big improvement in the Louisiana Derby is ZAPPERINI, who finished a well-beaten fifth in the Risen Star , but was coming off a maiden victory and only two career starts, and did rally a bit from 11th after breaking from the 11-post. By Ghostzapper, out of a Smart Strike mare, he is certainly eligible to improve. He breezed an easy 5 furlongs in 1:02 2/5. COCKED AND LOADED moved a step closer to his 3-year-old debut, breezing a half in :49 1/5 at Tampa Bay Downs. Paul Reddam’s pair of FRANK CONVERSATION and RALIS both turned in solid works, with Frank Conversation, preparing for the UAE Derby, going a half in :48 3/5, and Hopeful winner Ralis starting to pick up the tempo, working 5 furlongs in 1:01 4/5. At Santa Anita, the late-developing DENMAN’S CALL, third in the Robert Lewis Stakes, worked a sharp half in :47 4/5. I WILL SCORE, third in the Robert Lewis, drilled 6 furlongs in 1:12 4/5 for Jerry Hollendorfer. TOEWS ON ICE, who hasn’t run since his disappointing effort in the Smarty Jones Stakes, worked 5 furlongs in 1:01 1/5 for this week’s San Pedro Stakes. Miracle Wood Stakes winner MARENGO ROAD will try to make it back-to-back stakes wins in this Saturday’s Private Terms Stakes at Laurel.